Have you ever wondered how well your system is being utilized throughout a long stretch of application runs? Or whether your system was misconfigured, leading to a performance degradation? Or, most importantly, how to reconfigure it to get the best performance out of your code? State-of-the-art performance analysis tools, which allow users to collect performance data for longer runs, don’t always give detailed performance metrics. On the other hand, performance analysis tools suitable for shorter application runs can overwhelm you with a huge amount of data. This article introduces you to Intel® VTune™ Amplifier’s Platform Profiler, which provides data to learn whether there are problems with your system configuration that can lead to low performance, or if there’s pressure on specific system components that can cause performance bottlenecks. It analyzes performance from either the system or hardware point of view, and helps you identify under- or over-utilized resources. Platform Profiler uses a progressive disclosure method, so you’re not overwhelmed with information. That means it can run for multiple hours, giving you the freedom to monitor and analyze long-running or always-running workloads in either development or production environments. These metrics provide system-wide data to help you identify if the system―or a specific platform component such as CPU, memory, storage, or network―is under- or over-utilized, and whether you need to upgrade or reconfigure any of these components to improve overall performance. Figure 1 shows system configuration view of the machine where we ran our tests. The two-socket machine contained Intel® Xeon® Platinum 8168 processors, with two memory controllers and six memory channels per socket, and two storage devices connected to Socket 0. 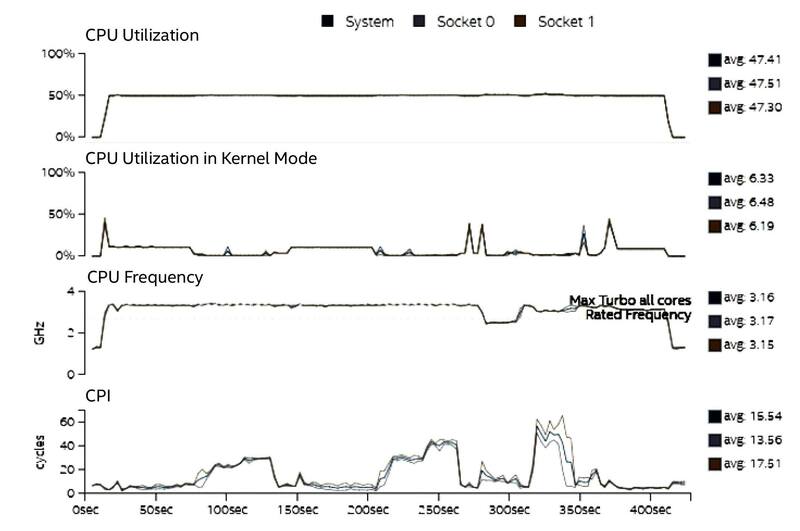 Figure 2 shows CPU utilization metrics and the cycles per Instruction (CPI) metric, which measures how much work the CPUs are performing. Figure 3 shows memory, socket interconnect, and I/O bandwidth metrics. Figure 4 shows the ratio of load, store, branch, and FP instructions being used per core. Figures 5 and 6 show memory bandwidth and latency chart for each memory channel. Figure 7 shows a rate of branch and FP instructions over all instructions. Figure 8 shows L1 and L2 cache miss rate per instruction. Figure 9 shows memory consumption chart. On average, only 51% of memory was consumed throughout the run. A larger test case can be run to increase memory consumption. In Figures 5 and 6, we see that only two channels instead of six are being used. 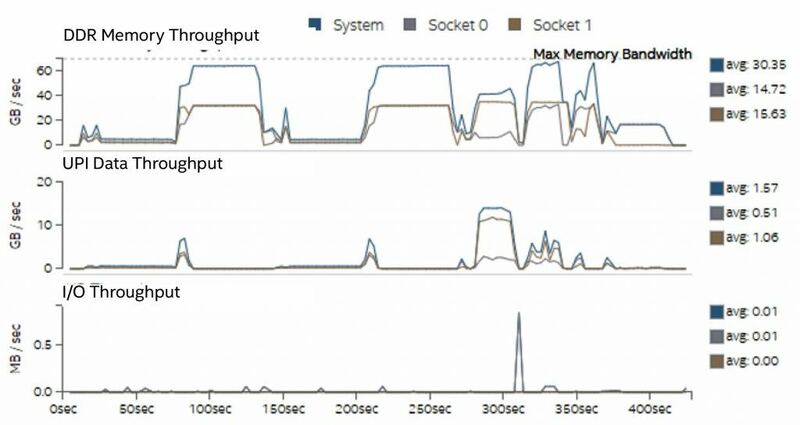 This clearly shows that there’s a problem with the memory DIMM configuration on our test system that’s preventing us from making full usage of memory channel capacity―leading to a performance degradation of HPCC. The CPI (Figure 2), DDR memory bandwidth utilization, and instruction mix metrics in the figures show which specific type of test―either compute or FP operation- or memory-based―is being executed at a specific time during the HPCC run. For example, we can see that during 80-130 and 200-260 seconds of the run, both the memory bandwidth utilization and CPI rate increase―confirming that a memory-based test inside HPCC was executed during that period of time. Moreover, the Instruction Mix chart in Figure 7 shows that between 280-410 seconds, threads execute FP instructions in addition to some memory access operations during 275-360 seconds (Figure 3). This observation leads us to the idea that a test with a mixture of both compute and memory operations is executed during this period. Another observation is that we may be able to improve the performance of the compute part in this test by optimizing the execution of FP operations using code vectorization. HPCC doesn’t perform any tests that include I/O, so we’ll show Platform Profiler results specifically on disk access from a second test case, LS-Dyna*, a proprietary multiphysics simulation software developed by LSTC. Figure 10 shows disk I/O throughput for LS-Dyna. Figure 11 shows I/O per second (IOPS) and latency metrics for LS-Dyna application. The LS-Dyna implicit model periodically flushes the data to the disk, so we see periodic spikes in the I/O throughput chart (see read/write throughput in Figure 10). Since the amount of data to be written isn’t large, the I/O latency remains consistent during the whole run (see read/write latency in Figure 11). In this article, we presented Platform Profiler, a tool that analyzes performance from the system or hardware point of view. It provides insights into where the system is bottlenecked and identifies whether there are any over- or under-utilized subsystems and platform-level imbalances. We also showed its usage and the results collected from the HPCC benchmark suite and the LS-Dyna application. Using the tool, we found that poor memory DIMM placement was limiting memory bandwidth. Also, we found a part of the test had a high FP execution, which we could optimize for better performance using code vectorization. Overall, we found that this specific test case for HPCC and LS-Dyna doesn’t put any pressure on our test system, and there’s more room for system resources―meaning we can run an even larger test case next time.